Continuing the renewal of its liturgy, this new volume is a major addition to the Church in Wales' range of worship resources. Approved for use by the Governing Body of the Church in Wales in 2008, this volume will be essential to all clergy, readers and to many lay people. The texts are thoroughly revised and seasonal variations are provided. 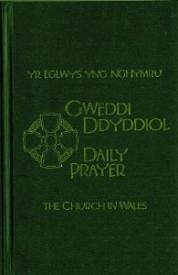 In addition, a supplement of additional prayers and readings from Wales' rich literary and spiritual heritage is included. As with all Church in Wales publications, this is a bilingual edition with Welsh on the left hand page and English on the right throughout.